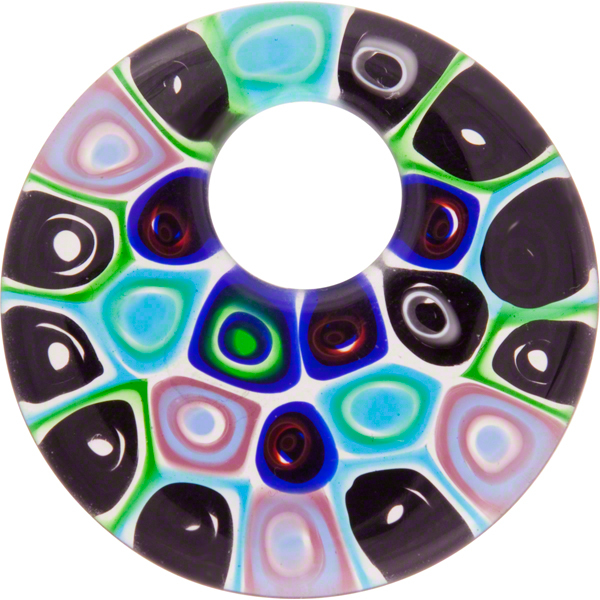 All you need is a cord and loop it through these wonderful Murano Millefiori Pendants. Colors match all our other Murano Millefiori beads, so earrings are also easy to match or a bracelet. Handmade in Murano using the famous Moretti Glass. Size is approximately 42mm (not quite 2 inches) in diameter with a hole slightly oftset to the top and approximately 15mm in diameter. These are very trendy with the younger set. The color is Amethyst, purple, black and aqua. This picture is representative, no two ever alike and the exact placement, millefiori vary on each piece.